While the physical safety of Montenegro’s journalists is far from guaranteed, a more troubling trend toward using media professionals to settle professional or business scores is undermining the country’s news outlets. Describing mass media in Montenegro, Marijana Camovic, a journalist and head of the Trade Union of Media, says the deep-rooted division between pro-government and pro-opposition media has now reached a completely new level. Television news and newspaper front pages are filled with the “dirty laundry” of journalists that work for competing outlets, she said. As a result of the smear campaigns, more journalists are leaving the profession. These departures leave empty spaces that are filled by people who are willing to work for lower wages and compromise on journalistic integrity by publishing what they are told to publish. Ethical and professional journalism is becoming scarcer, according to Camovic. At the same time, there has been a drastic decrease in circulation, lower advertising income and growing debts for outlets. Camovic said the Montenegrin media’s catastrophic economic condition can no longer be denied. Camovic points out that the main issues affecting media professionals are no longer impunity or physical assaults. Today, the major areas of concern include a lack of respect for media workers’ rights and falling salaries; fair remuneration for freelancers; and the rights to unionise and collective bargaining. However, this is not to say that journalists’ safety is no longer an issue. Take, for example, the case of Tufik Softic, who has been under constant police protection since February 2014. In November 2007, Softic was brutally beaten in front of his home by two hooded assailants wielding baseball bats, and in August 2013, an explosive device was thrown into the yard of his family home. The European Federation of Journalists (EFJ) sent an open letter to Filip Vujanovic, president of Montenegro, in June this year expressing their “regret that no concrete action has been done to bring the perpetrators, who are behind these attacks, to justice”. As Index on Censorship’s Mapping Media Freedom project highlights, the tactics of intimidation have shifted. 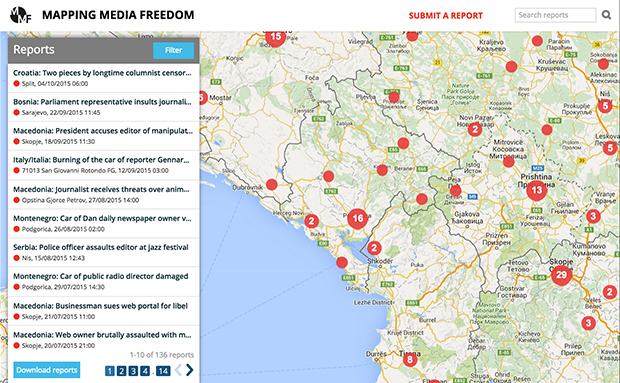 Between February 2014 and October 2015, there were 23 verified media violations in Montenegro. Most of those incidents involved attacks on journalists’ property, with cars being a popular target. Last year, Human Rights Action (HRA) outlined in a report that there were 30 instances of threats, violence and murder, as well as attacks on media property between May 2004 and January 2014. “I think that everything should be changed – from the approach towards journalism to the dynamics inside the guild,” she says. But the biggest mistake, Camovic emphasises, is that journalists are taking part in the blackmailing game, which has resulted in the absolute collapse of professional standards. Camovic points to the almost uninterrupted 24-year political rule of Milo Dukanovic, the passivity of Montenegrin society and the absence of the rule of law as contributing to the dire situation.